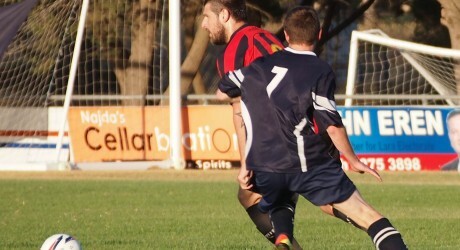 Corio made sure that this year’s Grand Final in the Geelong Diversity Cup will be a replay of last year’s match against North Geelong by defeating Geelong Rangers by a goal to nil at Elcho Park on Sunday night. There were only four minutes left to play and both sides were down to ten men, when Corio striker Vedran Stojanovic found a bit of space in the penalty area leaving himself one-on one with Rangers keeper Hayden van der Chys. Stojanovic converted this chance which was almost the first he had received since the second minute when he headed Chol ‘Peter’ Mangar’s long diagonal cross over the bar. Referee Daniel Breen had his hands full in a taut competitive match in which he sent off Mijo Marinovic of Corio and David Valys of Geelong Rangers. Strangely he stopped the game in the second half after marking the spot for a Rangers’s defensive wall, then wandered off for a drink before restarting the match. There was another curious incident when the Corio keeper took a goal kick and only succeeded in putting the ball over his own goal line gifting Geelong Rangers a corner kick. Rangers’ coach Andy Ingham brought himself on as substitute when his team went a goal down but he was unable to find an equaliser for Geelong Rangers. In the early game Geelong gave several of its younger players a run but was still too strong for Lara though it could not score in the even and scoreless first half. Jordan Nelson had been late in arriving for the match, so he started on the bench. Coming on at the beginning of the second he settled the match with a fierce drive in the 47th minute. Rangers and Geelong are now the most likely to contest the play-off for third spot; Meantime next Friday, Bell Park meets Geelong and Lara completes the round robin stage against Geelong Rangers. Four Corio stalwarts at the Geelong Diversity Cup, left to right, Joe Fiala, Mario Gregorio, Sergio di Blasi, Sophocles Mantzaridis. Jasmin Ikanovic of Geelong about to shoot under challenge from Lara’s Dylan Weeks (7).